Williams Lift Company is a division of Williams Surgical which was opened in 1947 by Thomas E. Williams. Family owned and operated for 3 generations since 1947. We treat our customers like family. 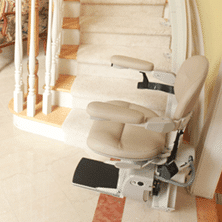 We are the first stair lift provider in New Jersey. Our first stair lift was installed in 1965. We have a staff of factory-trained technicians with over 50 years of experience. We offer our "on call" 24/7 service, guaranteed. We service what we sell! We offer a convenient showroom location with 5 working stair lifts, a modular ramp and several reclining lift chairs for you to try. We feature made in America stair lifts and wheelchair ramps. Don't let stairs hold you back. Get the freedom and mobility you deserve. We come to your home at no charge and evaluate your stairway and give you an estimate on a stair lift or wheelchair ramp. We repair Bruno, Acorn, Brooks by Acorn, and Sterling stair lifts even if they weren't purchased from Williams. We can be at your home usually within 24-48 hours of contacting us. After we measure, we can install a stair lift within 24-48 hours. The installation takes less than 2 hours. If you don't need your stair lift anymore, we may be interested in buying it back. 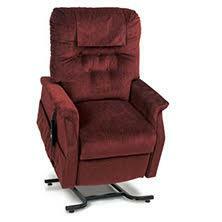 We buy back Acorn, Brooks by Acorn, and Bruno stair lifts. Impressed by the quick service – both measuring and installing. The installer was meticulous and very polite. Williams Lift Company came out the same day and gave us a quote. We were happy with it and they were able to install the lift that day! The installation took an hour and everything works great. Would recommend them to anyone. Very much appreciate the helpful phone calls from the company as well as ability to set up installation on such short notice. With everything else going on with your situation, Williams made this aspect of home care one less thing to worry about. For more information on all of the products we offer to the New Jersey and North Jersey areas, please make an appointment to visit our showroom at 24 South Avenue in Fanwood, NJ or schedule for our mobile showroom to come right to you! We are among the largest vendors in New Jersey and North Jersey. Don't take our word for it. Read our customer's reviews. Williams Lift Company specializes in Bruno stair lifts and wheelchair ramps. We are proud to be one of the oldest companies offering stair lifts in NJ, serving our NJ residents since 1947. Our goal is to see that our customers are able to age in place and stay in the home they have grown to love. Our dedication to providing quality stair lifts in NJ is helping to make the entire senior community of NJ safer and happier. 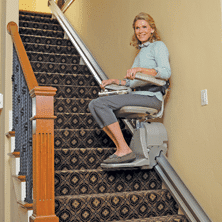 For over 65 years, the senior residents of Union County, NJ and surrounding parts of North and Central Jersey have relied on us as their supplier for stair lifts in NJ, -- also including wheelchair ramps, stair glides, stairway chairlifts, platform and elevator installation and repair services. Our Bruno stair lifts and Brooks by Acorn stairlifts come in a variety of models to ensure that your comfort and budget needs are met. We provide new or refurbished indoor and outdoor chair lift and stair lift options, and also offer the rental of stair lifts and ramps. We serve New Jersey residents with our elevators and serve the 07023 area, providing repair and installation services for stair lifts in NJ. Make an appointment to try out our Bruno and Brooks by Acorn stairway lifts in our beautiful, new showroom in Fanwood, NJ. Williams Lifts carries aluminum ramps in a number of different types and models. We are pleased to offer our customers a variety of ramps, including portable ramps, modular ramps, threshold ramps, tri-fold ramps, and pathway ramps. 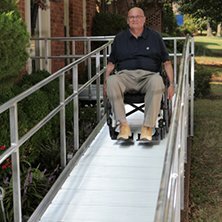 Our ramps can be purchased if you need them long-term, and a unique service we offer is the ability to rent wheelchair ramps if you only need them temporarily. In addition, we'll also take care of the installation of the ramp so you won't have to worry about anything. Contact us today to learn more about our mobility equipment and how to receive a free in-home evaluation. - Please note that we only service New Jersey residents.